Performance Time: Approximately 30-45 minutes, 32 pgs. CHILDREN’S COMEDY. 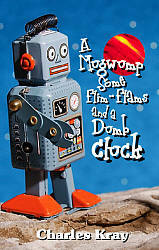 A greedy Mugwump has stolen the thinking boxes of all the Flim-Flams on his planet. Without their thinking boxes, the poor Flim-Flams find that they are completely under the Mugwump’s control and must do whatever he says. Determined to help his fellow Flim-Flams, Barpf journeys to earth, lands outside Jackie’s window, and convinces her to return with him to retrieve the thinking boxes from the Mugwump’s garage. Young audiences will love the Mugwump’s adorable but not-too-bright assistant, Cluck, and can join in dancing the Flim-Flam dance and singing the Flim-Flam song. This delightful action-packed play is perfect for both young actors or touring groups. Charles Kray is an award-winning playwright whose plays have been produced in regional and college theatres throughout the United States and Australia. Mr. Kray earned an MA in playwriting from UCLA, where he was awarded the MCA fellowship in creative writing. Mr. Kray lives in Carson, CA.